I am a member of the Collective Bias® Social Fabric® Community. This #shop has been compensated as part of a social shopper amplification for Collective Bias and its advertiser. We aren’t big sports fans in my house, but we do enjoy what I like to call “Football Food”. Ever since I was little we’d always have a Big Game party complete with buffallo wings and other delicious appetizers. I have to admit I really like the commercial watching and seeing what shenanigans will occur during half time. So today I have a few quick and easy game day food ideas that are little to no prep perfect for keeping you glued to the game or so you don’t have to miss that commercial everyone will be talking about! I really like to have options at parties but I have a problem with lots of people RSVP-ing yes to my parties and then about 50% of them actually showing up. Only for my gender reveal party more than RSVP-ed showed up so now I’m even more confused on how much food to prep. My solution is to have party food that 1) can be made quickly and last minute depending on how many people show up and 2) can be frozen and still will be yummy for the future. One of the best things I’ve found for this is doctoring up pre-made food. 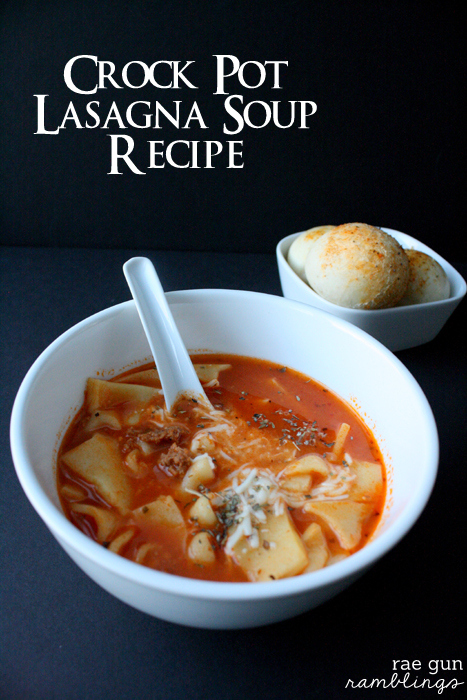 My latest semi-homemade creation is my Lasagna Crock Pot Soup Recipe. 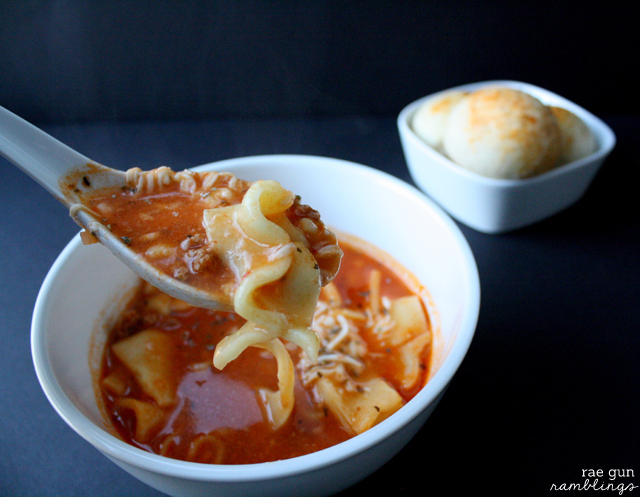 My sister made a lasagna soup that was SO amazing I’ve been thinking about it for months. The only thing is that it had loads of ingredients and I just had a feeling the work was unnecessary. So armed with a Stouffers frozen lasagna from Walmart I decided to try and see if I could make a low maintenance crock pot version. It turned out great, total comfort food but with a twist. Not only that but it’s totally freezable so I’ve got a couple of big containers waiting for when the baby comes. 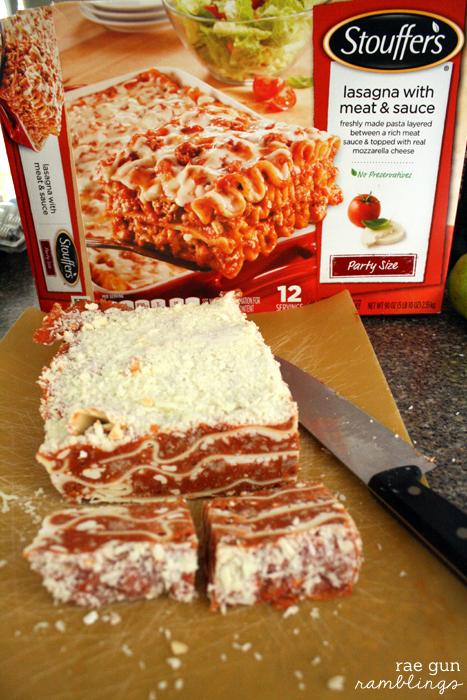 Leave lasagna to thaw enough to be cut with a knife. I put mine in the fridge the night before. It was definitely still frozen when I pulled it out of the fridge but cut-able. As long as it’s not frozen solid you’re good to go. Cut into 1 inch slices and place in crock pot. Cover with chicken broth. I used 9 cups of water and 7 bouillon cubes (my cubes each make 1 C broth). Cook on high for 3 hours or until heated through. Season with Italian seasoning and garlic salt to taste. Top with a sprinkling of shredded mozzarella if desired. So yummy. This is definitely a recipe I’ll be keeping in rotation and on hand for parties. 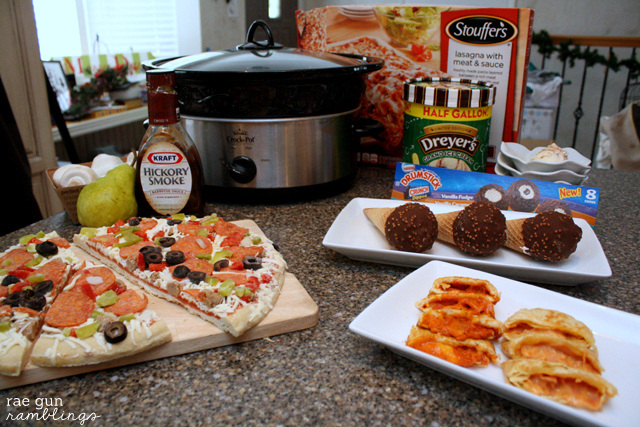 Another thing I like to do for easy party food is to have a pizza station. DiGiorno frozen pizzas are great for this. My husband likes supreme but I don’t do olives or peppers so I like to pre cut slices and have them out so that people can remove toppings they don’t want or add others to fancy it up. In the past I’ve put out various yummy cheeses, pear (it’s good trust me), mushrooms, cooked chicken, BBQ sauce, you get the point. But the idea is that people can adjust the pizza to their pallet and also cook it when they are ready so it can be nice and fresh for the eating. This is genius! I never would have thought to use a pre-made lasagna!! Thanks for the recipe! This looks absolutely delicious! I think I am going to have to run by the store, I find myself craving lasagna! OKAY!!!!! Seriously, I would have NEVER thought to put Frozen Lasagna in the Crock Pot!! That is OVER the TOP BRILLIANT!!! Oh thank you! I did think I was pretty clever haha. But really it’s super yummy you should try it! Nice and easy. That’s right up my alley. Yum. I can’t stop laughing… Yeah that’s way easier than mine. You’re a crazy genius. See I’m putting that Masters to good use! Totally perfect for a soccer night. I know when I’m out late-ish I just don’t feel like cooking when I finally get home. It’s a yummy spin but definitely hit’s that same spot! Brilliant! I cannot wait to make this!!! 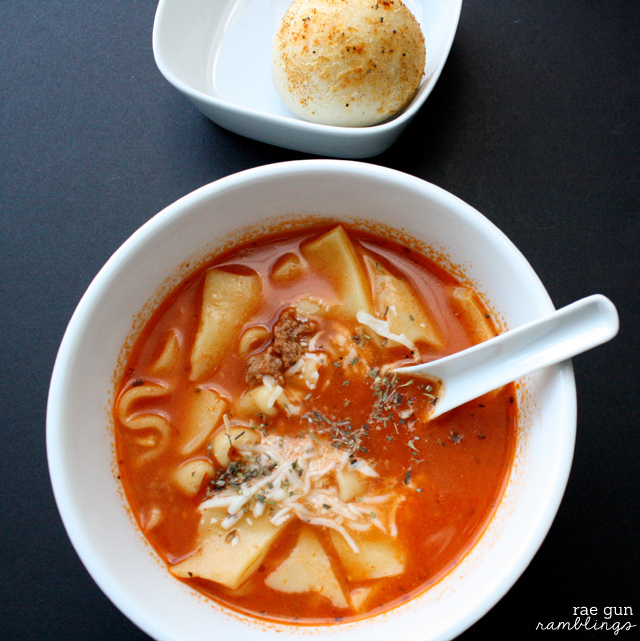 with the wind and flurries we have here, that soup looks like perfection. Off to the grocery store! Oh this looks so good! Pinned! This sounds SO good, and I love how easy it is! Pinned!! That is SO smart to use the premade lasagna! I never would have thought of that! It’s yummy I hope you like it! Marissa, I love this idea! Fun and easy! 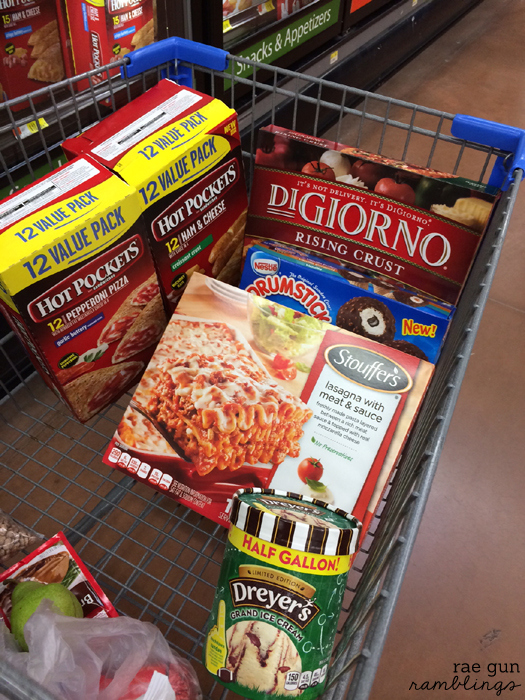 Have you made this with a smaller amount than the party size stouffers. I think I may only need family size and was thinking of doing the cheese lasagna without the meat. Any advice? thanks!! I tried this recipe for a Football Rivalry Game Night (at home)! It was easy and tasted GREAT!!! Will use this fun recipe in my food rotations!! THANKS!! Happy Holidays!! I love easy, I will have to try this sometime! This soup is definitely on the menu this weekend! Thanks for sharing.